Customs and Border Protection’s Rio Grande Valley Sector via Associated PressIn this photo provided by U.S. Customs and Border Protection, people who’ve been taken into custody related to cases of illegal entry into the United States, sit in one of the cages at a facility in McAllen, Texas, Sunday, June 17, 2018. Breitbart News accused the Associated Press of using “politically-charged” words to describe the detention facilities on the US border. And a Fox News host commented that the facilities look more like “security pens,” rather than cages used to hold animals. Breitbart News argued that the Associated Press wrongly described a converted warehouse used to detain migrant families in McAllen, Texas as containing “cages” for children. 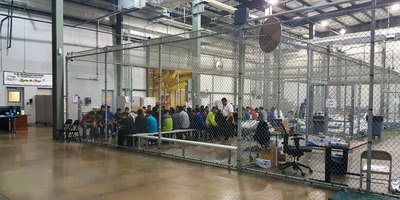 The AP wrote, “hundreds of children wait away from their parents in a series of cages created by metal fencing” in the South Texas facility. “The AP’s choice of words is only the latest in what appears to be a series of politically charged word choices by the wire service,” Breitbart’s Joel Pollak wrote on Sunday. But the Fox host conceded the “images are stark,” regardless of what word is used to describe the facilities. “[The Border Patrol spokespeople] said they may be cages, but they’re not being treated like animals,” CBS host Gayle King reported Monday morning. DOOCY: Some refer to these [child detention facilities] as cages. I'm from a farm community, I see the chain-link fences, it's more like a security pen to me.